It’s time for Jose Melendez’s KEYS TO THE MITCHELL REPORT. 1856 The Supreme Court rules that escaped slave Dred Scott, is property and cannot be taken away from his owner without due process. 1894 French soldier Alfred Dreyfus is convicted of passing military secrets to the Germans. 2007 Roger Clemens is accused of steroid abuse by Sen. George Mitchell. Do you see where Jose is going with this? You must. There is injustice in the world. There has always been injustice. Some days, there is more than on others. Sometimes injustice is driven by racism and greed. Other times it is caused by anti-Semitism. On still other occasions, it is due to an abhorrent lack of instant replay in professional wrestling. Yet today in our country injustice burns a little hotter, stings a little sharper, for in our national pastime, it has happened again. Bu not only has injustice transpired once more, it has taken a more odious form. The victim of today’s injustice is not a slave, a Jew or even a Mexican. No he is a victim more reviled than even these once loathed classes. The sad soul is a white Christian millionaire. Yes, gasp. Gasp in horror at the evil in the world. And unlike those who have come before him this man, this poor pathetic man, does not even get the dignity of unjust imprisonment, loss of liberty or confiscation of property to illustrate his plight. His punishment is nothing less horrible than being named in a non-binding report to the Commissioner of Baseball that has no legal weight whatsoever and cannot result in any meaningful sanction. Truly, Jose weeps for Roger Clemens. Today’s injustice was not caused by bigotry or the lust for glory, but rather by a deviant devotion to empiricism and a madman’s commitment to the notion that overwhelming evidence is indicative of guilt. What would Jefferson say? Yes, this is the kind of country we have become. The United States of America is now a place where a man, a great man, a man who stood face to face with Jeff Suppan and almost won, can be openly slandered by a convicted felon, and never given the opportunity during the investigation to refute claims. Or more specifically, where a man who has several times almost made it through the first few innings of critical ALCS games can be given an opportunity to refute accusations, decline that opportunity, and then complain that there has never been an opportunity to dispute the story. If this continues rest assured that the disappearance of habeas corpus is next. Or possibly, before. Jose gets confused. As you go to bed tonight, filled perhaps with shadenfreude or fahrvergnuegen, Jose want you to think: What if it were you? What if you had just made tens of millions of dollars for a few below average innings on top of more than $100 million over the course of your career? What if you were regarded by many as the greatest pitcher of all time? Wouldn’t you trade it all away for a clean reputation? Wouldn’t you offer those achievements up like so many Jacoby Ellsburys and Jed Lowries for the Johann Santana of vindication? Jose weeps for the nation. 3. Why did Mo have to be in there? Mo Vaughan did it. He absolutely did it. They even have a check from him. The case against Mo Vaughn is tighter than Jeff Loria on Marlins payday. There was a time when this would have broken Jose’s heart. That time was 2PM this afternoon. To Jose, Mo always represented what was good about baseball, what he loved about the game. Mo loved baseball, he loved Boston and he loved being a leader in the community. For Christ’s sake, Jose bought his children’s book “Follow Your Dreams” and got it autographed. And now this. 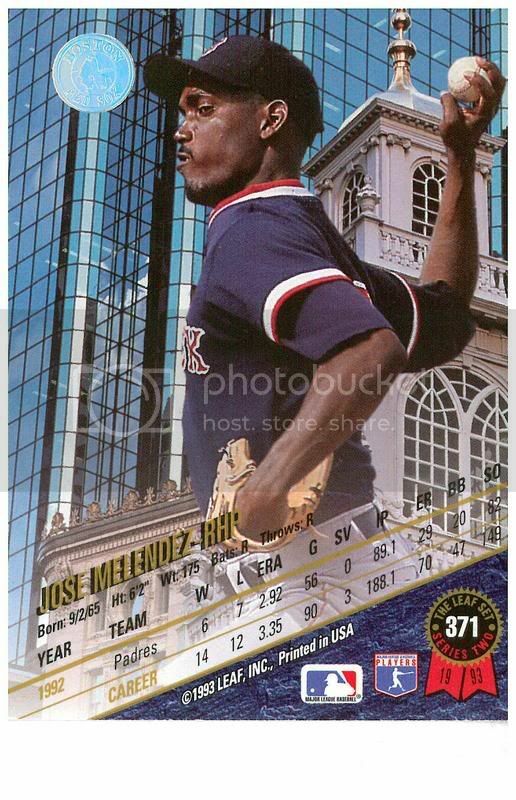 Jose would have preferred that it was anyone from the pre-2004 Series Red Sox. Nomar, Rich Garces, Toby Boreland, anyone but Mo. Jose supposes he can take some comfort from the fact that evidence indicates that Mo did not try the stuff until the end of his career when he was with the Mets desperately trying resuscitate a deteriorating body ravaged by sore knees and fried dough. There is something less odious, though perhaps more pathetic, about an athlete using drugs to keep a career alive, rather than to go from good to great. Still, it makes Jose weep. Mo Vaughn was his first baseball hero. Not his first favorite player, Jose was in college by the time Mo won the MVP, but the first player Jose truly saw as heroic. He was noble and decent and committed. And now what is he? A tragic hero, Jose supposes, a good man with a pronounced weakness for strippers and fleeting glory. I’m Jose Melendez and those are my KEYS TO THE MITCHELL REPORT.